Well, here I am in a chilly cold North Wales at the SFX Weekender, Europe’s largest and best scifi con, with a great view of the beach and a sea full of oddly lovely looking wind turbines. Tomorrow at 5pm will see the steampunk panel with the UK’s leading writers in the genre. 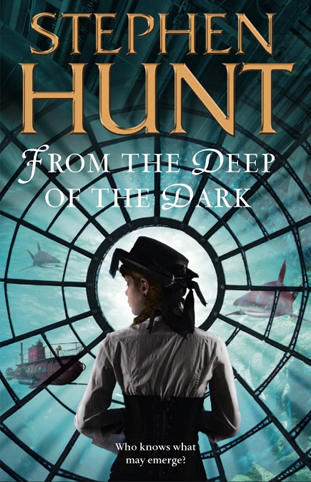 I’m told that the 6th novel in my Jackelian fantasy series (set in a Victorian-level steampunk future), From the Deep of the Dark, is already shipping from Amazon. Yipee. And talking of Amazon, if you have a Kindle, you can also download my new spy-fy novella, In the Company of Ghosts, free – but only until this Sunday. Get it here from the UK or here from the USA. And thanks for the free book! Hi Vincent – thanks for spotting that (it’s what happens on WordPress when you don’t add a full http:// to a URL – groan). Fixed now. All the best – Stephen. Thank you very much for the novella. I don’t read nearly as much as I used to. I remember back in high school, polishing off a novel every three days or so, waiting for my next big box from the Science Fiction Book Club. Where has the time gone? How many novels have I started to write that languish in coma, awaiting conclusion? What a ghastly array of half built Frankensteinian monsters have I left in my wake. I would really like to finish at least one before I kick off into the next dimension. And to be published! Ach, it is too much to hope for. Maybe I’ll just pretend in doesn’t matter, and then get one done just for s**ts and giggles. Every issue of your magazine is inspiration. Gotta act on it. I’ve got to. Thanks. Cheers. Well, Gridsleep, as they say in the US of A… keep the faith! Thanks for the freebie – “In the Company of Ghosts”. I read it in about 2 days, couldn’t put it down. I’m a-working on it, Jerry, I’m a-working on it!